"The 4th Parallel" - Part 3: "Regicide"
Despite certain misgivings that Superman and the rest of the League might have, the Red King from the reality where he chose to defeat the JLA by becoming a hero continues to win the love and devotion of the general public. Wonder Woman even admits her feelings for him after he reveals his true identity to her. Batman's suspicions are piqued when John Dee, who was catatonic when the Red King made his first appearance, starts repeating the supposed hero's name over and over. While the version of the Red King from the reality where he killed the League grows bored in the realm of Doctor Destiny the Justice League from the world where the Earth was destroyed welcomes Batman, who had survived the planet's destruction. He even brought the men responsible and reveals what he believes had been going on. He also tells the League that the reality they exist in must die and eventually the rest of the League agrees with him, though Superman is the last to come around. With the aid of that Materioptikon that Batman secured from the Watchtower they manage to get Plastic Man to Dr. Destiny's realm before the Red King destroys their reality. Plastic Man follows the trapped Dr. Destiny's instructions to stay quiet and plays an important part in convincing the JLA of the heroic Red King's world of what is going on. They draw out the "heroic" Red King and begin to fight him when the alternate Red King shows up. The two Kings argue and begin to fight. The "heroic" King drops his mental defenses and allows J'onn to read his thoughts before the two Kings merge into one. The Justice League takes the battle to the Watchtower and trick the King into thinking that they had built the doomsday device from the reality where the Earth was destroyed. The trick works and the League is able to get the Red King back to Dr. Destiny's world where Destiny is free and wants revenge. The League places the Materioptikon in its trophy case and after discussing the two Plastic Men merging into one they renew their resolve to protect the world that they hold so dear. Story - 5: Well, that was a pretty epic ending. And completely unexpected as well. I mean I knew the Justice League was going to win, though it would have been pretty cool if the story ended with the Red King winning and this was just an Elseworlds type of story, but that is beside the point. During the course of reading this issue I got the sneaking suspicion that in the end the events of this story would have "never happened" especially with the fourth reality that was brought up. Of course that feeling evaporated when the Red King destroyed it. I would have been fine with that because, as I stated in my review of past issues of this story arc, while I normally hate that sort of storytelling here it was pretty much the way the story was constructed. The resolution to this storyline was well constructed. All of the pieces fit nicely into place with Slott and Jurgens (I don't know how much of the final result was plot or script) using all the realities established in previous chapters to good effect. I do have to admit that seeing Batman alive and well in the "Krypton Earth" reality took a bit away from that chapter because it had such a strong ending, but like John Stewart said it is Batman. Plus it gave the heroes an out to defeat the Red King so on an emotional level I thought that it was kind of a cop out but on a rational level it made sense. The debate between the "Krypton Earth's" Batman and Superman also made sense, though there is a part of me that believes that Superman wouldn't have been the only one who thought there had to be another way. At their core both Superman and Batman have evolved over the decades into the people who will always find another way, despite certain lapses that suggest the contrary. To have Batman say, "Ok, guys, I've mulled this over a bit and the only solution that my oh so smart brain can come up with is that we all have to eat a bullet and let this reality die," seems a bit off. Sure they fought to the end and managed to get Plastic Man into Dr. Destiny's realm but there is this part of me that keeps thinking that it was wrong somehow. Again the more rational side wins out especially when I realized that if Superman had been the one to get through instead of Plastic Man things may have gone horribly wrong. More than that, though, the reality they lived in wasn't the "real" one, so it is destined to be fodder anyway. Plus, Plastic Man got to be the hero. I may not care for the character but I do like when a writer (or writers) does things, neat things with characters I am ambivalent towards. The resolution complete with the righteous retribution that the Red King would be receiving at the hands of Doctor Destiny was very satisfying. From beginning to end this story was well thought out and gave us as the audience three very different scenarios that were followed through to their natural conclusions. The release schedule made this story go by really fast, but it still ranks up their as one of the best this series has seen. Next month begins the much delayed "Kid Amazo" storyline and it has a lot to live up to both in terms of how long we've waited for it and how good the past two story arcs have been. Art - 5: After seeing Al Milgrom and Jerry Ordway provide the finishes Trevor Scott's work doesn't seem to measure up and I say seems because the art was still very strong. My quibble is not with the level of talent but more of personal taste. Despite this I was rather pleased with the art in this final chapter. Jurgens' layouts remain strong, which doesn't surprise me because the man knows how to design a page. I wasn't totally thrilled with the revamped costumes of the Justice League members from the "Krypton Earth" reality but it served to separate them from the "real" League at least on a visual level. It's nice to see that Batman got the memo on the costume changes while transporting out of a crumbling planet. Maybe the change in costume was one of his contingency plans. "Ok, guys, if the Earth ever bites it and we have to terraform Mars and transport the entire population there in a hurry the first thing we do when things get settled is adopt these costumes I designed. Except Superman and Plastic Man. They get to keep theirs". Yeah, I know. Not all that funny, but I tried. I was also pretty keen on the fact that Superman's Fortress on Mars had an entrance that resembled the Earth-2 Superman's mountain hideaway. But then I like references like that. And I guess the idea that Jurgens was doing the old school, Carlin era Krypton got changed somewhere down the pike because the Jor-El and Lara sure looked like the Birthright Krypton to me. Oh well, I don't care either way. It still looked good. I also enjoyed the melting effect Jurgens and Scott did for the wiping away of that reality. The fading lettering and the dripping panels were effective in conveying that universe slipping away. Like the writing the art on this arc was very strong and consistent. I've gushed over Jurgens before and I have no intention of stopping now. While the story was rooted rather firmly in the present (or at least the present of 2004) it had an old school feel to it as well. Cover Art - 4: I really feel bad for Dr. Destiny on this cover. I mean all this cool stuff happening behind him and he's stuck in a crystal. He looks rather unhappy too, but then again I would be too. 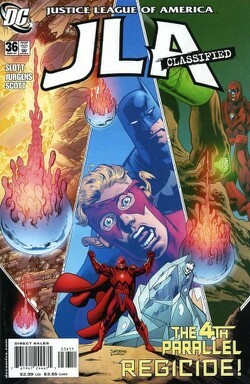 Jurgens and Nowlan deliver another solid cover, though. It wasn't my personal favorite of the series but a good one nonetheless. For two arcs in a row this titled has pulled off the trifecta of good story, art and covers, which to me is something of a minor miracle.